Reykjavik’s city council voted last week to ban Israeli goods in a symbolic gesture to protest Israel’s treatment of Palestinians. The city council of Reykjavik, Iceland’s capital, has voted to ban all Israeli-made goods in protest of the continuing “occupation of Palestinian territories” and Israel’s “policy of apartheid” against Palestinians. Concerns regarding Israel’s policies towards the Palestinians were renewed following Israel’s announcement in July that it would build Israeli homes in the contested West Bank, inciting violent protests. Most countries consider these new settlements, as well as previous ones, illegal, and even the US State Department has expressed its concerns over Israeli settlement expansion. In the past, Reykjavik’s city council has been critical of Israel and has previously adopted resolutions that acknowledge Palestinian rights to independence and a sovereign nation. According to Iceland’s foreign ministry, the small island nation purchased $6 million of Israeli imports, most of which in the form of fruits and vegetables, equipment, and machinery. Iceland’s national government said that the boycott would only be limited to the country’s capital and has tried to distance itself from the action of Reykjavik’s city council. Yet, as Iceland’s largest city and home to half its population, Reykjavik’s decision to boycott Israel will likely cause some economic impact though it is hard to say whether or not it will be significant. Israeli exports totaled $53.7 billion in 2014, meaning its exports to Iceland represent a meager 1.1% of its total annual exports. Overall, it appears that Israel is much more concerned with the symbolic impact of the boycott as opposed to its economic effects as they have been actively fighting against several recent international boycotts in response to Israel’s treatment of the Palestinian people, most notably the BDS movement (Boycott, Divest, Sanctions). Concerns about the growth of boycott movements have led Israel to pass legislation allowing for the deportation of foreign activists, to threaten the lives of BDS supporters, and to lobby for legislation in other countries to prevent future boycotts. They have even teamed up with Facebook to try and prevent criticism of Israel on social media. Some Icelanders were also critical of the boycott, including a local attorney who said the ban on Israeli goods violates the Icelandic constitution. It remains to be seen if Israel will take action against Iceland as a result of the new boycott. There has been an uproar in Canada since our government passed a motion condemning the BDS movement, claiming that bringing such economic and political pressure to bear is anti-semitic. Israel’s foreign minister, Emmanuel Nahshon’s claim that calls to boycott Israel are “Without any reason or justification, other than pure hatred” is patently absurd. BDS political and economic pressure aims to convince Israel to conform to International Law. If Nations can blithely choose which parts of International Law they will deign to follow without any repercussion (as Israel does in flouting of International Law by encroaching on the what little Palestinian territory remains with new settlements), International Law is meaningless. In light of the other attacks our Canadian Charter of Rights and Freedoms has been hit with of late, this blatant suppression of the Canadian right to dissent has upset a great many Canadians, myself included. 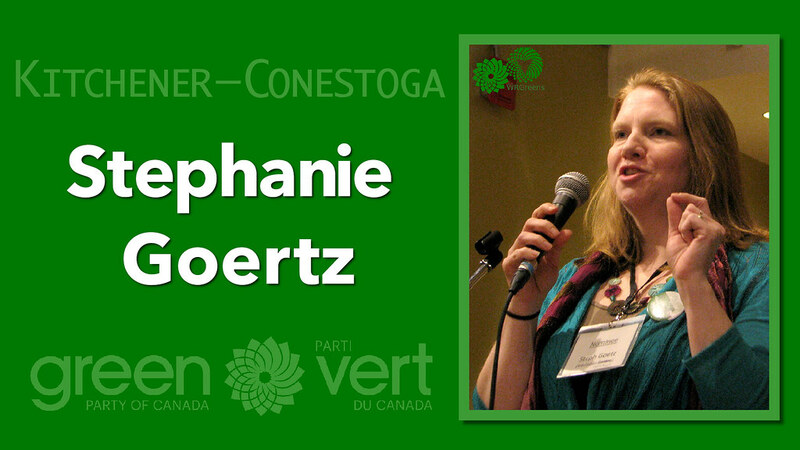 This summer the Green Party of Canada recently passed a motion to support the BDS and the right of Canadians to dissent, earning the distinction of being the first national Canadian political party to do so. When Israel ceases breaking international law, calls for BDS would dissipate, but it seems its current government won’t even consider accepting this simple solution. Iceland’s Capital Votes To Boycott All Israeli Products by Whitney Webb originally published in TrueActivist.com has been released under a Creative Commons Attribution 4.0 International (CC BY 4.0) License. Palestinian Loss of Land (1946-2010)” by Noorrovers published in Wikimedia Commons is released under the Creative Commons Attribution-Share Alike 4.0 International license. 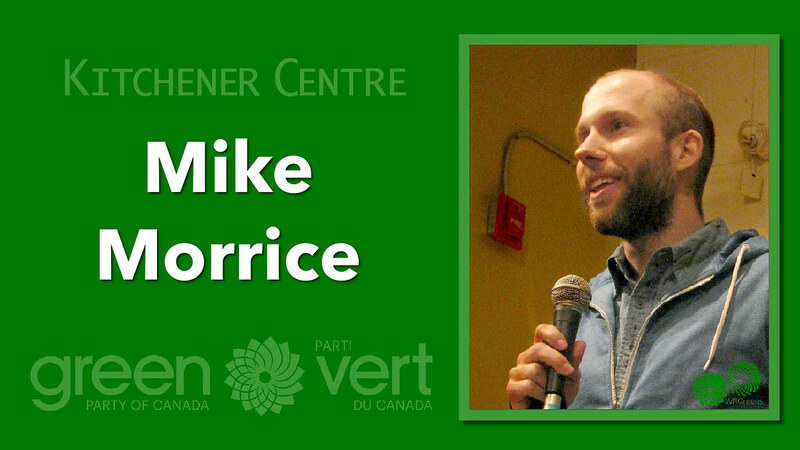 Waterloo Region Greens own Bob Jonkman will be presenting “Make every Vote Count” at the Elmira Branch of the Region of Waterloo Library, starting at 6:30pm, tomorrow night, Wednesday, September 21st, 2016. 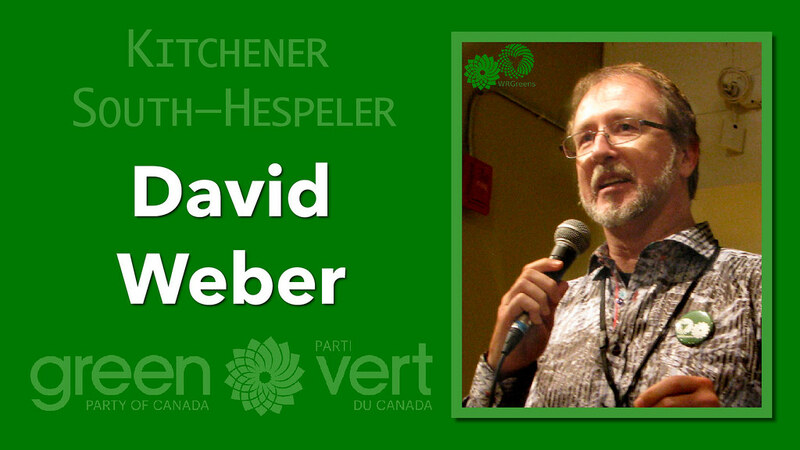 In his capacity as co-Chair, Bob helped develop the Fair Vote Waterloo presentation, which starts with our existing electoral system as well as Canada’s electoral reform options. There will be a question and answer session after the presentation. Next week there will be two more Information Sessions at the Region of Waterloo Libraries in New Hamburg and Ayr. 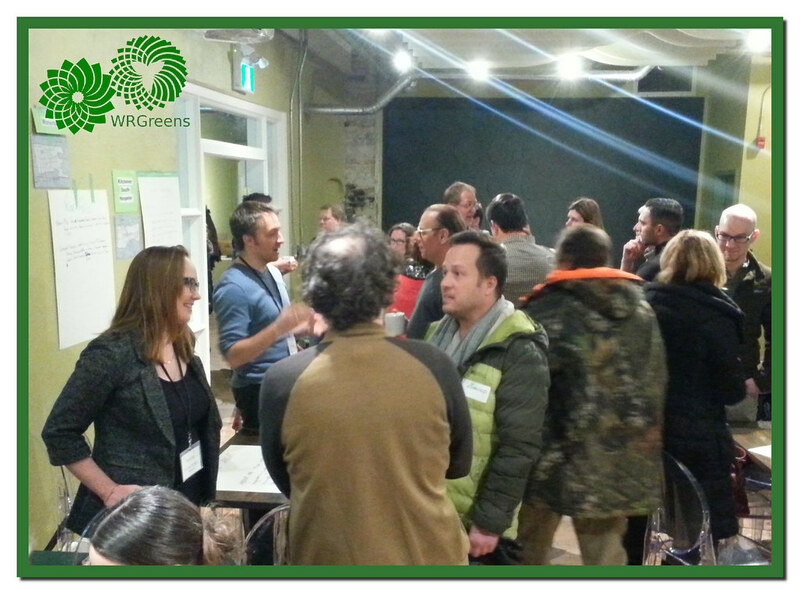 If Waterloo Region had a GPC Member of Parliament, we could look forward to having our own Green Electoral Reform Town Hall. Instead, Waterloo Region has 4 Liberal MPs and 1 Conservative MP. 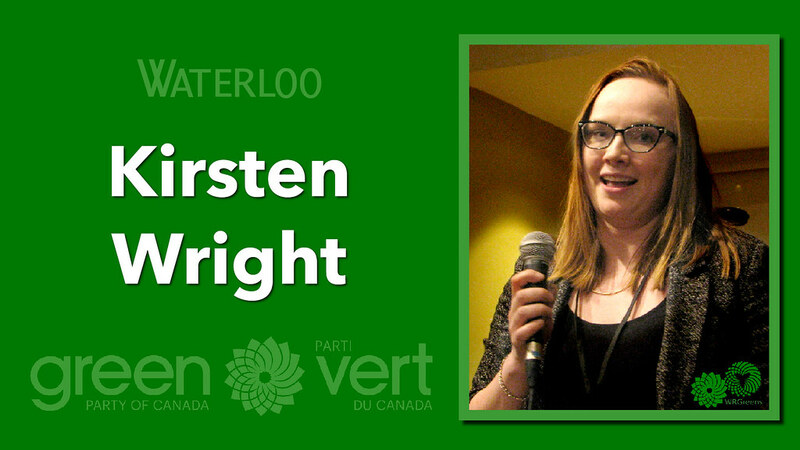 All 5 Waterloo Region MPs managed to attend the Climate Change Town Hall. Unfortunately we won’t see the same for Electoral Reform. Although the ERRE Special Committee on Electoral Reform is conducting a Canada wide tour, apparently it will only effect a single stop in the most populous province in the land. And that won’t be in Northern Ontario, but rather in the most populous city, Toronto, leaving the rest of the province out of the loop. The Minister of Democratic Institutions is trying to augment the Committee’s limited itinerary with a complimentary tour of her own, which will visit many more spots. Every MP in Parliament has been is tasked with hosting a Town Hall to consult with their constituents about electoral reform. Unfortunately, Kitchener-Conestoga MP has chosen to mail out a form letter questionaire (read: advertisement) encouraging citizens who have no idea of the alternatives to rally around a referendum (the CPC strategy intended to derail our long overdue electoral reform). As I understand it, instead of 4 Liberal Town Hall consultations in Waterloo Region, the 4 LPC MPs will join the Honourable Maryam Monsef in one big Town Hall event on Wednesday Night. This will be our only official ERRE Event, so though the event is being put on by Liberal MPs for a Liberal Government, everyone who can attend should attend to support Proportional Representation in the only opportunity we’ll have for face to face Government engagement on this most important reform. 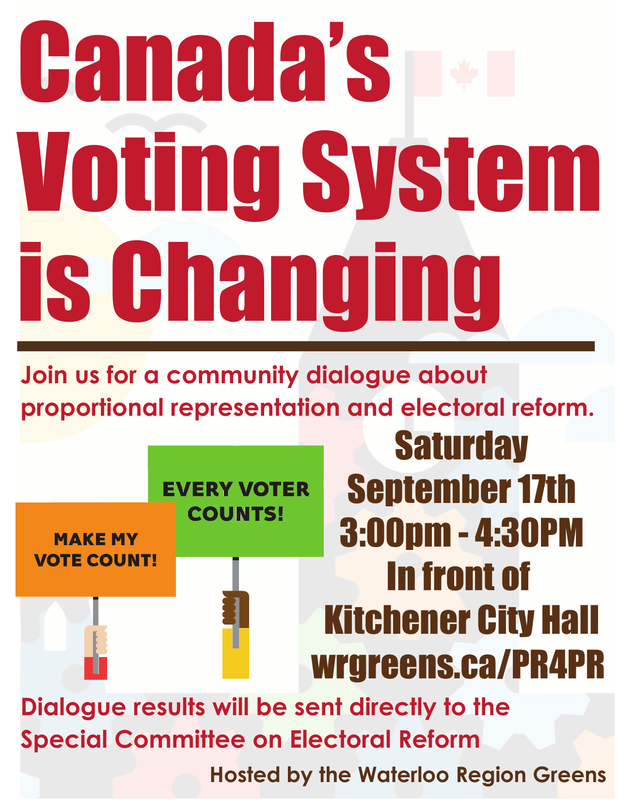 This is a must attend event for electoral reform supporters. Share the graphics to help spread the word! Do you know anyone who needs their own poster in other parts of Canada? Share the DIY posters below: all they have to do is fill in the event details! Can you imagine a better way to celebrate Democracy Week? 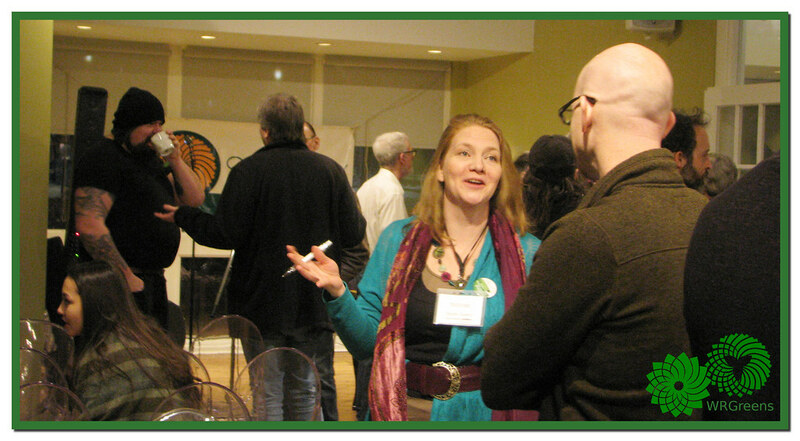 Contact Julia Gogoleva, the WR Greens organizer at julia.gogoleva@gmail.com. Anita Krajnc ‘s Lawyer James Silver explains what this case is really all about. The “Pig Trial” began on August 24th and 25th. Toronto Pig Save co-founder, Anita Krajnc, is facing charges for giving water to pigs en route to slaughter who were, as an expert testified last Thursday, “in all likelihood, in severe distress.” Although Anita is facing charges, it is the factory farming industry that is on trial. We praise those who intervene on behalf of a dog in a hot car. Yet pigs, whose intelligence is likened to that of a toddler, are commodified, degraded to mere property or “things”, and robbed of their individuality. This concept of sentient beings as property is part of what Save activists seek to address in the Pig Trial. In Canada, pigs are allowed to be transported for up to 36 hours without food or water. These are some of the weakest standards in the world. The farmer behind the charges, Eric Van Boekel, and his truck driver both took the stand. Krajnc’s lawyers, James Silver and Gary Grill, ran through a lengthy line of questioning of the farm and its operations in order to demonstrate that what Anita was doing was truly in the public good. Krajnc’s lawyer’s cross-examination of the driver made it clear that there was no real “mischief” involved: no profits were lost, the “property” – such that it is – was not damaged, nor was the driver impeded from doing his job. Van Boekel was asked details of his operation including the treatment of the pigs, confinement practices, antibiotics, nutrition, and environmental impacts. Disturbingly, Van Boekel made many comparisons to human mothers while on the stand. When describing the containment facilities for pregnant pigs, he stated, “Like most mothers can attest to, their hormones flare up. They kind of don’t know what they’re doing.” He explained that hormones combined with their territorial nature was the rationale behind confining pregnant pigs in “gestation stalls” for days on end. Van Boekel explained how female pigs are artificially inseminated with a pregnancy lasting for 114 days. After little more than a month, her piglets are weaned, and she has only 4-9 days before she is impregnated again. I should hope sympathetic women everywhere would be outraged. Most ironic was the questioning that explored environmental impacts, such as when Van Boekel plead guilty after his farming operation contaminated a local river. Van Boekel suggests he was concerned about “contaminants” Krajnc may have had in the “unknown liquid”. But, when samples were offered, the driver refused without even once checking the animals to see if they were in distress. Despite proclamations of concerns about “contaminants”, no precautions have been taken since, despite the hundreds of individuals joining Krajnc every week. Krajnc and Toronto Pig Save have sparked a worldwide movement of “Save” groups. She and hundreds of others bear witness to animals on their way to slaughter. These animals are scared. They can hear the screams and smell the blood. Pig Save also uses social media as a tool to ensure their stories do not remain invisible. It is clear their activism is having an effect. More than ever, people are talking about where their food comes from. Bearing witness is not easy. But, as Krajnc states, when one sees suffering it is our duty to move closer and try to help, not to look away. It is past time for our laws to be updated to give all non-human animals the respect and dignity they deserve. The Pig Trial resumes on October 3rd in Burlington. Note: An edited version of this letter was published in the Cambridge Times.